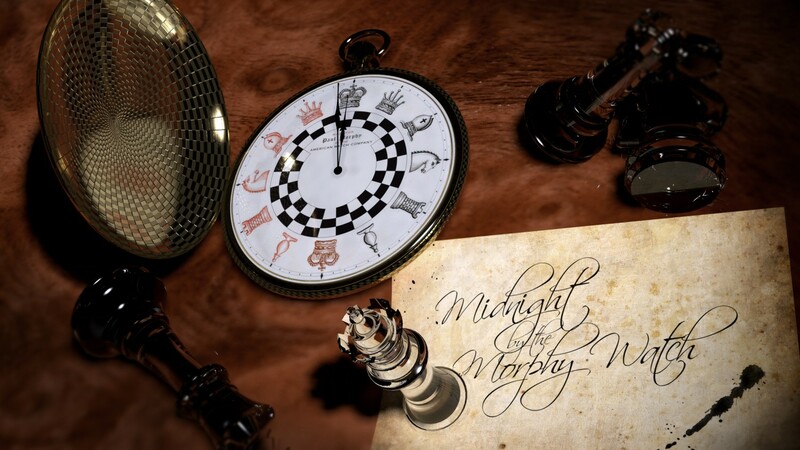 Perhaps his most famous, certainly the most collected chess story is ‘Midnight by The Morphy Watch’, written in 1974 and first published in Worlds of If. Stirf Ritter-Rebil (not one of Fritz’s more tricky names) is a chess player who has risen about as far as he will, and plays casual games and aspires to not much more, til he comes into possession of the famed Morphy Watch, and gets more than he bargained for. 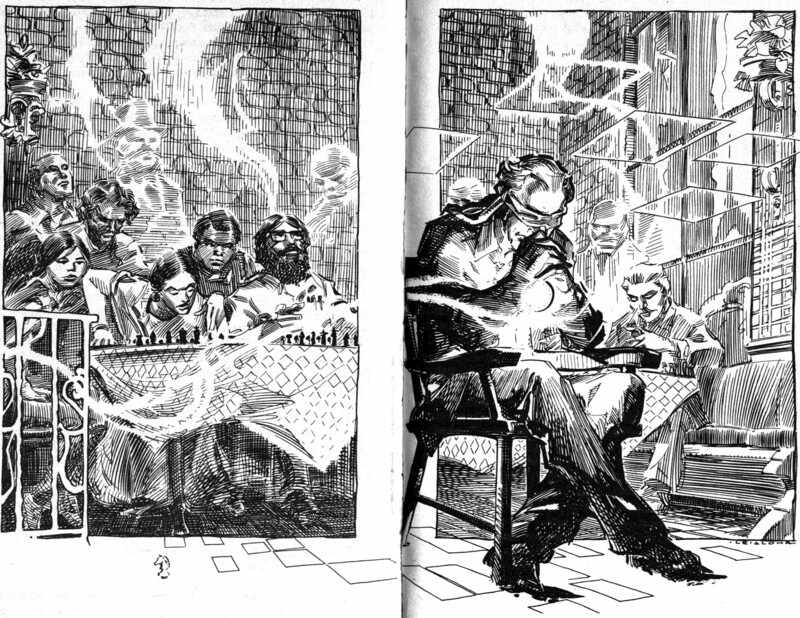 Chess lover or not, it’s a good story well told, and can be seen as a descendent of ‘The Dreams of Albert Moreland’, though that story is more doom laden and was written 30 years earlier. He also was presented with an exquisite gold and silver chess set, the location of both is still unknown (more info here). Stirf’s discovery of the pawn and then the watch is a pleasure to read and the shop, I suspect, is one of those disappearing shops we find in fiction, manned by an unexpected owner. 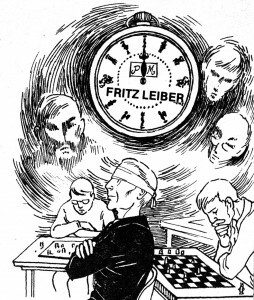 What I also love in the story is that Stirf’s problems are obviously Fritz’s own, the obsessional nature of chess would indeed rob (or frustrate) Fritz of his ability to write, the chess nightmares suffered by Stirf, I suspect come from Fritz’s own experience. Chess is a strong willed mistress. As for Stirf’s mini Faustian adventure, I shan’t spoil it for you, if you haven’t had the pleasure of reading it. I always loved the idea of the watch, so I spent several hours creating my own version (from Fritz’s description and from the real watch) and you can see that at the top of the page, and more clearly below. 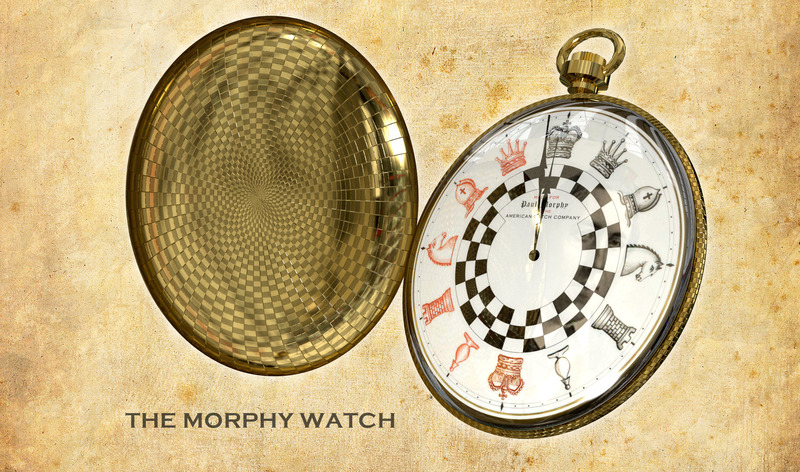 The face does use elements from the actual watch face given to Morphy, where as the chess men are just standard. I no have a nice animation of it spinning around, though what use that is, I am not sure! Great visuals too. I can really appreciate the motivation (and time/effort) behind this kind of work, which can often be overlooked when the internet is so full of so much credible digital imagery and indescribably bad fan art. Hats off! It is a strange enthusiasm that started at 16, it is the texture of his stories that I never tire of, it is one of life’s joys to have passions, whatever they are for. Suspect more than passing familiarity with Photoshop but still amazing. Reflections on curved surfaces and spiraling any which way. Some unintentional taxicab associations. 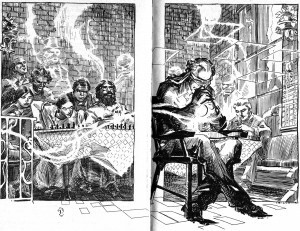 In church towers, square dial, the dead corners were sometimes filled in with alphas and omegas. – Wonder what the dial would have looked like with split kings (half white/half black). What a fine set of reviews on your site! If it is Ok, I will link out from my various pages.